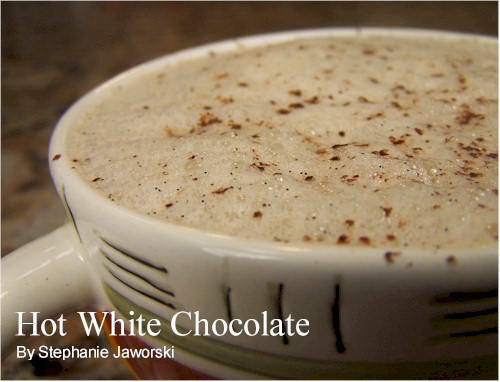 While I was working on the Hot Chocolate and Hot Cocoa recipes for the site, I came across a recipe for Hot White Chocolate in Bonnie Stern's 'Cooking with Bonnie Stern'. It sounded really delicious, the combination of white chocolate, pure vanilla extract, instant espresso powder and hot milk. After making it I was not disappointed. It tastes absolutely wonderful; sweet and creamy from the white chocolate, and balanced with just the right amount of mocha flavor. Of course, if you don't like the taste of coffee, you could leave out the instant coffee powder. It is important when making this beverage to use good quality white chocolate. Check the label and make sure it lists cocoa butter, along with sugar, vanilla, milk and lecithin on its label. Stay away from brands that do not contain the ingredient 'cocoa butter' and instead use a vegetable fat. They are not as good and you will definitely notice the difference in how the hot chocolate will taste. Some good brands to look for are Lindt, El Rey, Valrhona, and Callebaut. Since white chocolate burns easily we are not going to heat it with the milk. Instead place the chopped white chocolate, vanilla, and instant coffee or espresso powder in your blender. Then add the hot milk and process until nice and foamy. Alternatively you could place the ingredients in a bowl and use a hand held immersion blender instead. Pour the hot chocolate into your mugs and dust with cocoa powder or grated dark chocolate. Hot White Chocolate: Place the milk in a small saucepan over medium heat until it is nice and hot. Meanwhile, place the chopped chocolate, instant coffee powder, and vanilla extract in your blender. Then pour the hot milk into the blender and process until nice and foamy. Pour the hot chocolate into two cups and garnish with a dusting of cocoa powder or grated chocolate. Can also garnish with softly whipped cream. Makes 2 servings. Preparation time 20 minutes. Stern, Bonnie. 'Cooking with Bonnie Stern'. Toronto: Random House of Canada: 1986.